Do I need to take a CBT? Come sensibly dressed (denim jeans are better than jogging bottoms), and sturdy footwear is essential to protect your feet. If your clothing is not appropriate we reserve the right, for your safety to re schedule your training. Remember to bring your licence (both parts if applicable) and the balance for the price of the course. We suggest you bring a lunch with you. The course is partly theory discussion and practical training covering elements as defined by the DSA. 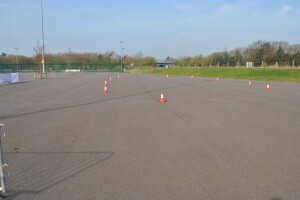 The course is theory and practice, theory discussion will cover the choice of clothing and equipment as well as the basic principles of roadcraft- hazard and speed awareness for example. 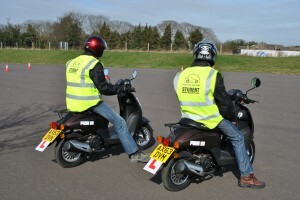 Practical training will cover the basics of motorcycle care as well as the correct use of the controls. It also includes riding the bike in a controlled off road site.The final section of the CBT is a road ride of at least 2 hours in length. The sequence of the CBT training is aimed at supporting the student to develop knowledge and control of the bike before they go on the road for the first time. You can either do your CBT on our bikes or your own so long as it is road legal, taxed, MOT’d if necessary, in roadworthy condition and has ‘L’ plates front and rear. Please note that we do not arrange collection of your bike for the course or delivery after the course is completed (or any storage of the bike). If you are using your bike or moped you need to show us your insurance, MOT and tax disc, if not on the machine. This is not a pass or fail course. It is a training course and you will receive your CBT Certificate (DL196) once the instructor is satisfied you have completed the course. We will support your individual two wheel learning needs. It is important you learn at your own pace. There is no pressure to complete the course in one day. If you do not complete the course on your first day you will be offered a second session of up to 4 hours without paying any extra for the training, but you will be required to hire the bike. This additional session is on a 1-2-1 basis with your instructor. Usually this is all you will need to complete the course, however should you require further sessions there will be an extra charge. The CBT is divided into 5 elements, and before you can ride on the road you will need to satisfactory complete all 5 elements. In each element you will need to demonstrate that you have understood what has been taught before moving onto the next element. In this element your instructor will explain the basics of the CBT as well as information regarding clothing and equipment. In this element you will be introduced to the controls of your moped or motorcycle, starting and stopping the moped or motorcycle, as well as basic safety checks. In addition you will be shown the correct use of the stand as well as wheeling the bike and bringing it to a controlled stop using the front brake. In this element you will begin to ride the moped or motorcycle. This will include riding the moped or motorcycle in a straight line and stopping, riding slowly, showing correct use of the brakes, changing gear, riding a figure of eight, emergency stop, rear observation, turning left and right, and U turns. In this element you will be prepared for the on-road element of the CBT. You will learn about the vulnerability of being on two wheels and how as a rider you can raise your level of conspicuity. You will also learn about speed limits and the highway code, as well as the legal requirements needed for you to ride on the road. In addition you will be taught about the importance of rear observation, anticipation, road positioning and separation distances; all important areas that prepare you for the road ride. Road surfaces, weather conditions, and the effects of alcohol and drugs will also be discussed. This is the final element of the CBT. Over the course of a minimum of 2 hours you will complete a road ride accompanied with your instructor who will be in radio contact with you. You will need to demonstrate you can cope safely with the variety of road and traffic conditions presented to you.